Go to "Andenne" rail station (travel time: 15 minutes from Namur, 90 minutes from Brussels) or go to "Huy" rail station (travel time: 20 minutes from Liège). These station are accessible with the Belgium rail system, line 143 NAMUR-LIEGE. The music festival is not directly accessible from these rail stations, you need to take a bus. Use the bus line 143 HUY-COUTHIN-ANDENNE. Only few buses deserve this line every day, especially during the weekend, please check the schedule. 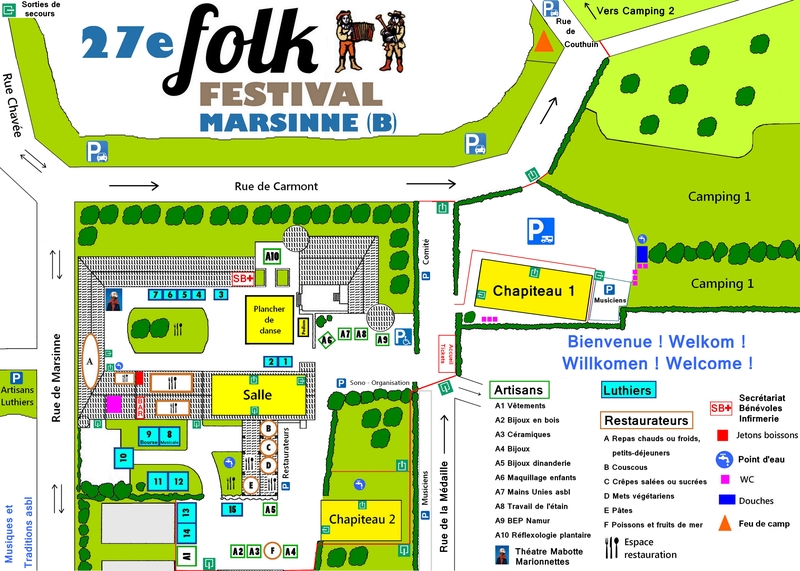 After getting off the bus at the stop "Couthin, Rue de Marsinne", go walking to the Castle-farm. A wide free area is usable to park your car and it is also possible to park your car on the street. Please respect the neighborhood, don't park your car just in front of the houses. A group of volunteers will help you to park your car and maximize the use of the parking, please follow their instructions and try to save the available space. A special parking for low mobility persons' vehicles is available at the end of the street "rue de la médaille", just before the ticket check. Highway E42 Liège-Namur, exit n° 8 "Huy/Héron"
At the highway exit, continue straight to the city direction "Huy" (road number: N643, road name: Chaussée de Wavre, global direction: Huy/Wanze/Héron) 600 meters / 650 yards. Near Fiat, Citroën and Alfa Romeo garages, turn right to the city direction "Couthuin" (road name: Rue de la Campagne). Continue straight and follow yellow or orange "Marsinne" road sign (see bellow) 1 kilometer / 1100 yards. You will be able to see the castle-farm.